With strong angles contrasting a pure inner light, Laterna complements both architectural and natural environments. Sequence outdoor pendants offer the most flexibility due to their clean forms and multiple variations, perfect for creative lighting designs. These outdoor globe pendants are perfect for a welcoming atmosphere, enhancing outdoor spaces with a glowing, organic aesthetic. The word "catenary" means any curve formed by a wire, rope or chain hanging freely from two points. Catenary pendants are mounted on a specially-designed catenary cable that is strung between two support structures (like buildings or poles). Each of our three outdoor pendant families is available in two types of mounting configurations: canopy and catenary. "Canopy" refers to outdoor pendants that are mounted underneath an existing structure like an overhang or roof, similarly to indoor pendants. Catenary pendants, on the other hand, are built to be suspended from a cable. The width and length of the catenary cable depends entirely on how many fixtures are suspended and how heavy those fixtures are—that's why catenary lighting designs must be completed with the help of a structural engineer. 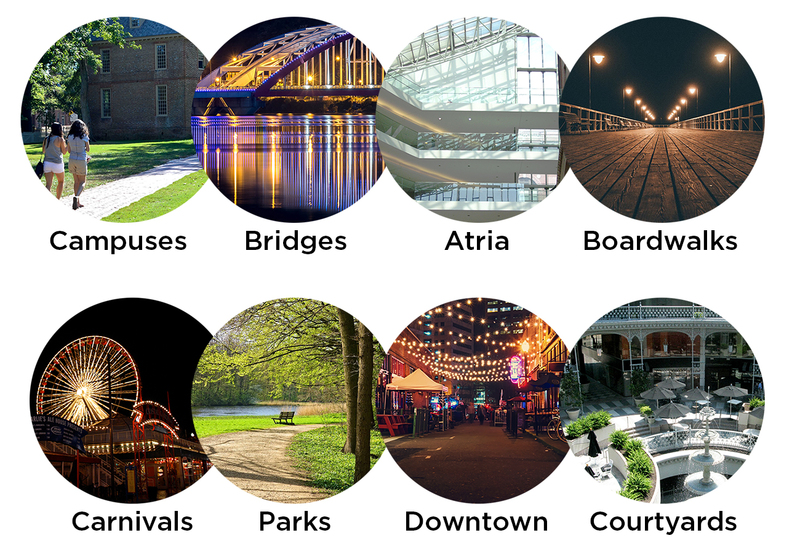 Where can you install catenary lighting? Trends show more business and leisure activities moving outside every year, and those spaces need a fresh look. 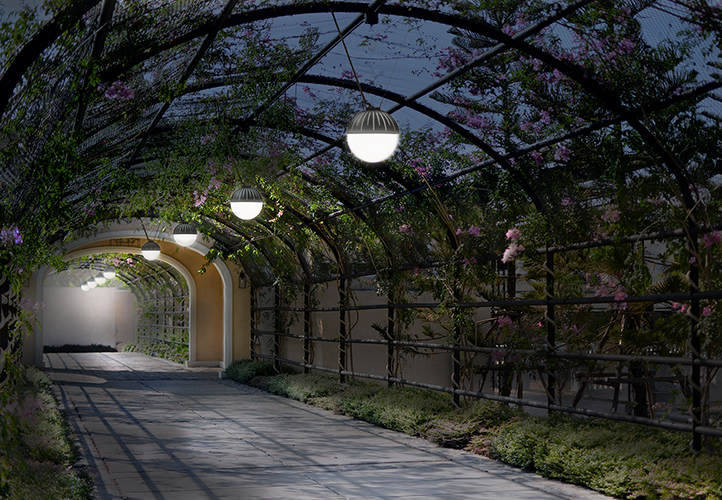 Without blocking walkways and views, catenary luminaires can span the light across wide areas. How are these catenary pendants strong enough to be suspended outdoors? Because they are subject to movement from wind and road vibrations, catenary lighting fixtures need to be particularly resistant. Laterna, Sequence, and Zume are all tested to UL1598 and IP65. In addition, they also pass ANSI C136.31, the national standard for roadway and area lighting equipment to withstand vibration. This test far exceeded the stress a catenary fixture would need to endure (because it is meant for rigid mounting), but all three luminaires were engineered to meet that mark. What can you do with catenary lighting? Because catenary designs allow you to span luminaires over outdoor areas without additional structures, the design possibilities are exciting. We designed the luminaire bodies and quick connection accessories to allow for flexibility of design without too much bulk. However, everything must be carefully calculated. A structural engineer must sign off on catenary designs to determine fixture weight, the space between structures, tether use, power connection, and the width and sag of the catenary cable. Check out our Catenary Design Guide for more information on architectural outdoor pendants and their design options. We are excited to ensure your design's success. Check out our Catenary Design Guide for diagrams and specific guidelines for beginning an outdoor pendant project. If you have any additional questions, please give us a call. 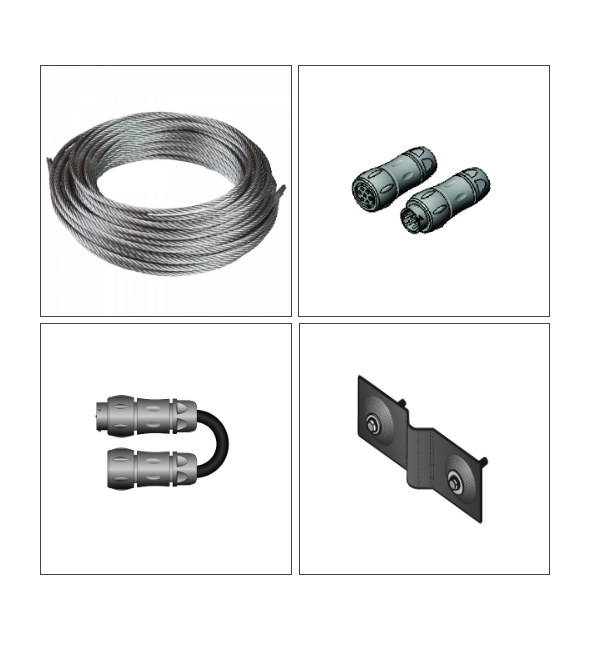 View all custom catenary accessories we offer to supplement your outdoor pendant lighting design. A few of these accessories, like the quick connections and mounting brackets, were specially designed by Visa Lighting engineers.